Mongolia considers that developing defense bilateral cooperation with USA is an important venue and rewarding tool for its foreign policy to preserve its National Security goals. Although official contacts to establish defense bilateral relations between Mongolia and USA trace its origins since 1991, during the past relatively short period of time it has undergone a spectacular development becoming an important pillar of the overall Mongolia-USA comprehensive partnership. The cooperation contributes to the Mongolian military reforms by means of strengthening defense/military institutional setup, promoting democratic civilian control and defense resources management instruments. The US expertise and material support has greatly contributed to the enhancement of Mongolian Armed Forces’ peacekeeping capabilities. Using the newly built peacekeeping capabilities of its armed forces Mongolia has expanded its participation in UN peacekeeping operation and started its contribution to the international Coalition efforts to fight terrorism, which in its term gradually contributed to the nation’s international visibility and helped to heighten its input to the international peace and stability. to increase Mongolia’s involvement in the Asia-Pacific multilateral security cooperation institutions, maintain exchange of information and experts on regional security affairs, contribute to the military CBMs in the region. Defense bilateral cooperation between Mongolia and USA is being conducted in accordance to “the Agreement on military visits and exchanges between the Government of Mongolia and Government of the USA” and other concerned bilateral and multilateral documents endorsed. High level visits and exchanges of defense and military leaders play an important role in strengthening the cooperation. US Secretary of Defense visited Mongolia in 2005, Under Secretaries of Defense in 2000, 2011, ASDs in 2009, 2013, PACOM Commanders and other high level defense and military officials visited Mongolia. From Mongolian side The Minister of Defense has visited US in 2011 and Chiefs of General Staff visit in 2004, 2006 and 2011. To facilitate defense policy information exchange and better coordination of the ongoing cooperation projects the Ministry of Defense of Mongolia and the US Department of Defense mutually agreed to establish Mongolia-US Bilateral Consultative Council (BCC). Launched in 1999 BCC now is the most important venue for bilateral discussion venue where cooperation experts from both sides headed by the Vice Minister of Defense for Mongolian delegates and Deputy ASD for US delegates exchange defense policy information, their views on regional security issues, evaluate last year’s activities and plan the next year engagements. The last BCC conducted in Washington DC in May 2013 was marked with mutual expression of intent that bilateral defense cooperation between the two nations should be upgraded to the next level of relations: the strategic partnership. Mongolia is active supporter and longtime partner for US led global war on terrorism. 10 consecutive rotations of the Mongolian Armed Forces contingent had contributed to the operation “Iraqi Freedom” between 2003-2008, our servicemen participate in coalition operations in Afghanistan since 2003. Along with enhancement of its peacekeeping capabilities Mongolia rapidly expanded its participation in UN Peacekeeping operations. Having deployed the first military observer in 2002 Mongolian Armed Forces now deploys more than 1000 personnel to serve to the noble cause under the UN mandate. The flagship event of the Mongolia-US defense cooperation calendar is the multinational peace operations exercise “KHAAN QUEST” held early at Five Hills peace operations training center near Ulaanbaatar. Conducted since 2006 “KHAAN QUEST” establishing itself as one of the main event of the peacekeeping training calendar of the Asia-Pacific. 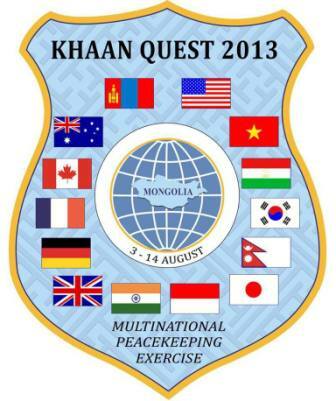 The last “KHAAN QUEST” has been conducted August 3-14, 2013 gathering up 1000 personnel from 14 countries. Mongolia-US bilateral defense cooperation played vital role in strengthening Mongolia’s defense reforms and military transformation. US DoD deeply involved in the process through the implementation of topical projects to influence Mongolia defense resource management, defense activities planning process, consolidation of democratic civil-military relations, non-commissioned officers core development and the advancement of professional military education and training institutions. Mongolia-US bilateral defense cooperation is based on mutual respect and understanding of sovereign defense policies of each nation, activities are executed through mutual consent and aimed toward common profits.